Welcome to Zahradka Art & Illustration, the online gallery and store for the painting and portraiture of Gary and Suzy Zahradka. We create works of art specializing in detailed portraiture. 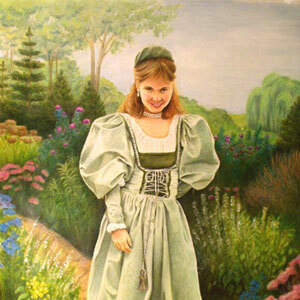 Our portraits include contemporary, historical and fanciful portraiture. We work in many mediums: portraits in graphite pencil, color pencil and traditional portraiture in oil paints. Portraiture using hand-made, historical pigments is one of our unique specialties! We strive to maintain the same energy, design and quality throughout all our artwork, regardless of the medium or genre. We hope you enjoy looking through our site and that it brings you a sense of wonder and imagination. Contact us to begin arrangements towards your own custom portrait work, or browse our portfolio to find fine portraiture in oils, watercolors, or pencil art. We're based in Minneapolis/Saint Paul, MN, but we're happy to work with you anywhere! The range of human emotion is vast and varied, yet constant and enduring thoughout time. With our artistic creations we endeavor to capture and hold those emotions; to enhance and strengthen them through our use of line, color and form. We strive to create a human connection between the viewer and our artwork: a link between the past and the present, between reality and fantasy.